Floyd “Pretty Boy” Mayweather Jr. and Shane “Sugar Shane” Mosley will duke it out at the MGM Grand Garden Arena this Sunday, May 2. To date, Floyd is universally recognized as the second-ranked welterweight, while Shane sits comfortably at the third spot. That means that win or lose, one of them is obligated to move on and face the number one ranked welterweight, which is Manny Pacquiao. That is, unless the immediate rematch clause becomes necessary. Yes, there is a rematch clause. A Digital Journal story reported that the Mayweather camp might have a hand in making this rematch take place sooner than later. Whether it’s because of his fear of losing to Mosley or simply to avoid Pacquiao longer, nobody’s certain. Even Manny himself didn’t hesitate in playing boxing analyst in this fight. Pacquiao will reportedly join veteran sportscasters Chino Trinidad and Quinito Henson in the commentary table this coming Sunday. FLOYD “PRETTY BOY” MAYWEATHER JR.
Floyd Mayweather Jr. is professional boxing’s black sheep, yet he continues to be spoiled as he takes home a whopping $40 million for this fight alone. That is, of course, around the same amount of money he could make should he decide to take on that other boxing box office draw. After Shane Mosley and Pacquiao, no other boxer fighting Floyd is worth that much money. Floyd’s prize money, of course, deems appropriate given his recent statement: “40 have tried and 40 have failed.” His 40-0 professional boxing record brought him to that big of a paycheck. At 33 years old however, Floyd hasn’t had many significant victories, other than wins over then-undefeated Ricky Hatton and aging fighters Oscar Dela Hoya and Juan Manuel Marquez. Despite being the match favorite among the two, he is facing an aggressor in Shane Mosley, which could be perfect for his game plan given his effective counter punching. It took Mayweather 14 years to finally come face to face with “Sugar Shane”, which is a real shame, considering Mosley’s dominance earlier in his career. All the same, we can see Floyd doing the dodging and eluding in this bout, given Shane’s bigger built and fearsome punching power. 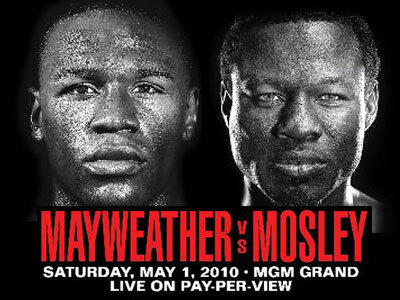 Truth be told, however, Mayweather is in a real risk of losing under the hands of Mosley, and worse, by way of knockout. Fortunately for him, his signature deceptive quick jab is one for the ages; one he must use against Mosley. His timing is also impeccable, perfectly explaining why his punching accuracy is one of the highest.